This video portrays a documentary of how the Khmer Rouge came into power in Cambodia– and specifically the United States role in this conflict. Warning: the video contains some graphic images. The United States involvement in the Khmer Rouge was not exactly innocent in influencing the horrific genocide that occurred. In short, the United States was at war with Vietnam when Sihanouk allowed for the Vietcong to set up camps along Cambodians borders. 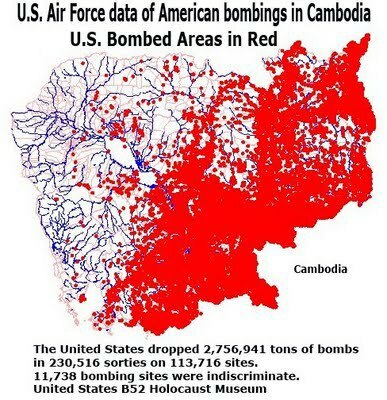 In response, the United States created a secret bombing campaign and began dropping bombs in Cambodia. They also supported Lon Nol, who overthrew Sihanouk in 1970. However, Lon Nol proved an unfair leader which led to the a civil war in Cambodia. After years of fighting, the Khmer Rouge took over in 1975. At first, citizens were happy because they thought the United States bombing would stop, as well as the fighting, until they were forced into labor camps and the genocide started. The United States and United Nations failed to recognize the situation as a genocide and not until the Vietnamese invaded Cambodia did the genocide come to an end. This genocide pertains to our positions as citizens today because we have a responsibility, as human beings, to recognize when a genocide is occurring and take action. The United States actually caused more tension within the country of Cambodia and failed to recognize the conflict for what it was, so I believe we should have taken responsibility for our mistakes and worked to save the innocent of Cambodia. However, we can learn from these mistakes of the past and take action in the future. If our country looks for signs of genocide, and gets involved when we are needed, we can avoid unnecessary deaths and work towards a more peaceful world.